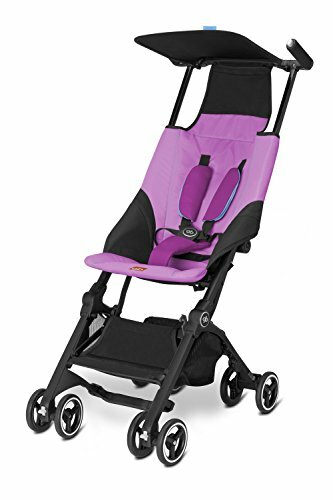 Pockit Lightweight Stroller by gb at Buggies And Babies. MPN: 616230018. Hurry! Limited time offer. Offer valid only while supplies last. The world's smallest folding strollerWith its exceptional design innovation, the gb Pockit is the 2014 Guinness World Records most compact stroller. View More In Lightweight - Page 14. With its exceptional design innovation, the gb Pockit is the 2014 Guinness World Records most compact stroller. When folded it is the smallest and most compact stroller currently available on the market, 12 x 7 x 14 inch to be precise. You can see why we call it the Pockit! The cleverly designed, compact fold uses the 2 x 2 D technique. This means that in only two steps the stroller becomes a compact and feather-light handbag shaped package (9.5 lbs), great for when you are on the move and practical and easy to stow away when you're not. For parents with a passion for city travel and exploring, the Pockit is the quintessential choice. With the ability to switch from pushing to carrying within seconds, the Pockit is ideal for trips by train, plane or simply visiting your favorite cafes.